This post is part of the Regaling About Richard Burton Blogathon, hosted by Realweegiemidget Reviews. Read the rest of the regaling posts HERE! I’m not going to sugar coat it, folks: the 1981 film Lovespell, starring Richard Burton and Kate Mulgrew, is awful. I mean, really, really, REALLY awful. Why did I choose it for the blogathon, you may ask? Richard Burton rises above the material and is quite good in it. Co-star Kate Mulgrew wrote about the experience of working with Burton in her (wonderful and highly recommended) memoir, Born with Teeth. Quite a tribute, especially when you realize she wrote it many years after his death, and was not looking to score points of any kind. If any of this sounds slightly creepy, his wife at the time, Susan, was present for all of this. Lovespell is the legend of Tristan and Isolt, that well-worn story about an old king who stupidly sends his handsome nephew to pick up his young fiancée and bring her to him via a sea voyage. King Mark of Cornwall (Burton) encounters the feisty and young Isolt (Mulgrew) on his way to meet her father, the nobleman Gormond of Ireland (Cyril Cusak). Mark and Isolt become friends. After he returns to Cornwall, he entrusts his nephew Tristan (Nicholas Clay) with an offer of marriage to Isolt. Tristan is also suffering from a festering wound and Mark wants Isolt, a gifted healer, to attend to him. Tristan and Isolt fall madly in love. Before leaving for Cornwall, Isolt’s maid Bronwyn (Geraldine Fitzgerald) gives her a love potion and directs her to share it with King Mark, thus saving herself from the disgrace of an ill-advised love affair with Tristan. On the voyage to Cornwall they become lovers. In Cornwall, instead of sharing the potion with Mark, she shares it with Tristan. She marries Mark but cannot stay away from Tristan. When they are discovered, Mark threatens to execute Tristan. He and Isolt escape but are captured. Mark banishes Tristan. Bereft of her lover, Isolt becomes deathly ill. In Brittany, Tristan is injured again. He sends a priest to Isolt, begging to be allowed to return so she can heal him. Mark, afraid Isolt will die unless he agrees to Tristan’s return, leaves to fetch him. When Tristan says he and Isolt will love each other forever, Mark raises black sails on the vessel, a signal to Isolt that Tristan is dead. When she sees it, she falls off a cliff. Tristan makes it to the shore and crawls to her just before they die together. Like I said, it’s a pretty well-worn story so it doesn’t feel like I’m spoiling anything by giving away the ending. The direction, by Tom Donovan, a well-respected television director from the Golden Age of Television, is dreadful. Maybe he had little experience shooting on location. Mulgrew should have shot the costume designer, who made her look frumpy and much older than 20 years old. Then there’s the casting of Burton and Clay as Mark and Tristan. Why, why, WHY do they do this EVERY time there’s a love triangle in a movie with an older man and a much younger couple? Burton is way more charismatic and interesting than Clay, who is downright insipid. Everything about the film is amateurish, including a film score that sounds like the temporary one movies have when they are shown to theater exhibitors before the studio finishes the final cut. As I said before, Burton rises high above the material. In fact, I’ve often found him a bit on the hammy side in some of his roles. Here he masterfully underplays the part. How I wish the material had been worthy of his performance, because in that case, I’ve no doubt it would be well known today. I’d not heard of this (wonder where I was). It sounds as if hearts were in the right place, but reach exceeded grasp. I applaud you for sticking with it and find the old pro in Burton’s turn. It may never have had a theatrical release, I’m not sure. I do know it was filmed several years before its release date. I knew about it because soap magazines reported on it at the time and I eventually found the VHS at Blockbuster. So you’re the other person who’s seen it! 😁 Thanks! So BORN WITH TEETH was really good? I remember flipping through it in a bookstore once, but not knowing much about Mulgrew beyond the TV stuff she did before VOYAGER and ORANGE, I wasn’t sure if I wanted it bad enough. She refrains from gossipy stuff to do with Ryan’s Hope and Voyager (it was written before OITNB, I believe). It’s very personal, about her eccentric family and her relationships and the ups and downs of being a working actress. The audiobook is great–she narrates it herself. Not seen this one so thanks for adding it to my blogathon, loved your honest take on the film… sounds like a potential guilty pleasure for simply to see Burton ham it up !! Would you agree? Too bad this one isn’t better! What a cast, and I particularly love the handsome Nicholas Clay who was so great in Excalibur the same year as this. I did get to see the talented Ms. Mulgrew on stage a few years back in her one woman show as Kate Hepburn—she was wonderful. I laughed so much whilst reading this! You have such a wonderful witty writing style! I have unsurprisingly never heard of this film. Such a pity that it wasn’t better made seeing as it had a solid cast. Really enjoyed reading this! 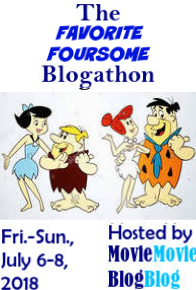 Previous Previous post: Greatest Film I’ve Never Seen Blogathon – Final Wrap-Up!